All of the units developed by Sylvania teachers during the Lourdes Summer Collaborative 2016 are at your fingertips . . .
You may not have the chance to visit your fellow teachers’ classrooms as often as you’d like (or perhaps ever), but you can still steal a glimpse into their teaching. One of the many ways that’s glimpse is happening this year is the sharing of the Lourdes Summer Collaborative. Over two dozen teachers from nearly all grade levels and buildings gathered this past summer to discuss and develop instructional units with a focus on differentiation. The collaborative discussed how to apply one or more qualities of differentiated instruction, such as using formative data to modify instruction, providing individual choice in student projects, diversifying support materials for different learning styles, and more. The result was a series of full units of study applying those approaches across the spectrum of Sylvania classes and student populations. And they’re here for you. The presentation below provides a directory of each participating teacher’s unit with a link to the full version. Each unit document is extensive, providing day-by-day breakdown of class activities, links to materials, and explanation and justification of each step. So open the presentation, browse through the units, and check out what your peers have created for you to share. Each teacher is listed with an email link, so feel free to contact them to discuss what you see. All teachers have agreed to allow you to use these materials as you will. Enjoy! Have you seen Achieve3000’s new look? Read this post for details and helpful resources to catch up! The user interface is new. A left sidebar provides access to the functions you knew from before. Check out this pdf or watch the video above for a tour. It’s pretty easy once you get the basic layout. Data for students now includes percentile ranks. “The Achieve3000 Hub” is a new location for online PD and tips. More state test prep material has been added. Easier grading of Thought Questions in the system results in fewer clicks. This document discusses all of the updates. Struggling readers get a lifeline with FluencyTutor! Thanks to Arbor Hills’ Tony Cutway for this resource introduction! Fluency Tutor for Google is a website and Google Chrome Extension that makes reading aloud more fun and satisfying for students who need extra support. It’s a big help for struggling and reluctant readers, as well as students learning English as a second language. Fluency Tutor for Google lets students record themselves reading and share with the teacher – away from the pressures of reading aloud in the classroom environment. Check out these teachers that know and use FluencyTutor in your school. Ask them for help! Are you or someone you know using this? Notify us, and we’ll post your or their name here as a building expert! Email to aclarkson@sylvaniaschools.org. Check out Paige Wyatt’s Tutorial on setting up Fluency Tutor! Welcome to the most powerful text-leveling resource, Achieve3000! Achieve3000 is a text leveler, basically. That means the service takes text and re-writes it at different Lexile difficulty levels for readers of different proficiencies. So, if one student reads at a third grade level, and another reads at a sixth grade level, they can read the same basic content, but expressed with vocabulary and sentence structures that fit their reading abilities. This leveling enables teachers to provide content that does not underwhelm or overwhelm readers. System diagnostics and monitoring that automatically determine a user’s reading proficiency and raises or lowers the text difficulty accordingly without the need for the teacher to do so. Reading levels of texts ranging from the earliest levels of elementary to the end of high school. Access to a wide range of data on student usage and performance, including standards-based reports. Test prep lessons that incorporate paired texts and next generation-style questions. Achieve3000 draws its content from the Associated Press and updates it frequently. The only major drawback to the service is the recency of content and its tendency to address conflict-oriented issues. Achieve3000 avoids serious conflict-based content. Achieve3000 is a reading program, so it should be used primarily to build reading skills connected to classroom content standards. Teachers using the content as part of instruction can use it to springboard into other learning activities or directly address reading skills as discreet and not connected to other content. Check out this SDL post for details on instructional strategies and read the teacher showcases that explore lessons in our classrooms. Also, consider reading the SDL article series of differentiation, which addresses the principles underlying differentiation in reading. It addresses Achieve3000 specifically as well. This video introduces the student experience for TeenBiz3000, the Achieve3000 product for junior high. High schools use Empower3000, which is basically the same. The spring round of Achieve3000 model lesson professional development showcased literacy in reading, physical education, and business classes. Following on the success of January’s model lesson professional development, more teachers had the opportunity to watch their peers deliver authentic lessons using Achieve3000 as a resource. These models followed the basic principles of solid Achieve lesson planning: student collaboration and engagement, teacher ownership of the resource, and authentic standards alignment. Read about the lessons and check out the plans the detail their flow! Abbey Stephens, co-teaching with Brittany Robbins, discusses step goals with a group of students. Brittany wanted her seventh graders to learn how fitness goals create an impact on physical activity. The approach? Gather the students in the gym, give them goals and pedometers, make them walk, and then make them reflect on the results. 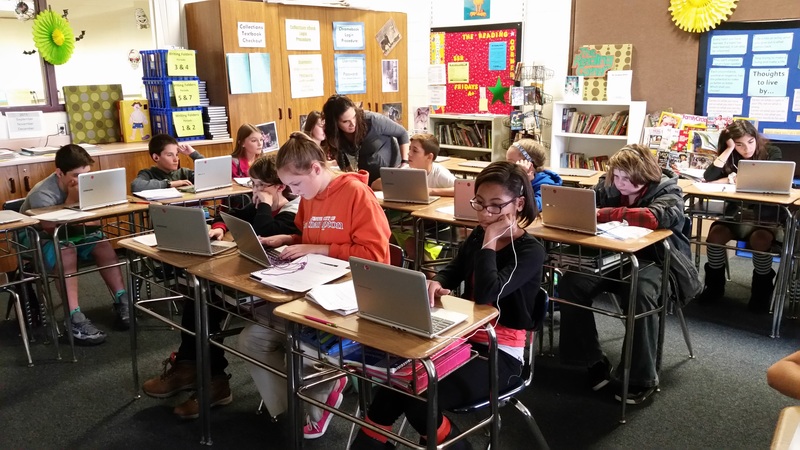 Achieve3000 added a literacy level to the lesson when the students read an article regarding adult use of pedometers, thus providing an authentic connection to non-school behavior. The lesson was not only a model in embedding literacy smoothly, but also showed incredible ability to keep students on task and reflecting with no re-direction. A student takes a moment’s break from walking to read about others using pedometers. Check out Brittany’s lesson plan and materials here! Jerry Bascuk discusses a student’s work in comparing article and text. Jerry had recently completed the instruction of a unit in sensible and responsible financial behavior, including considerations like saving vs. spending, balancing wants and needs, and planning for the future. 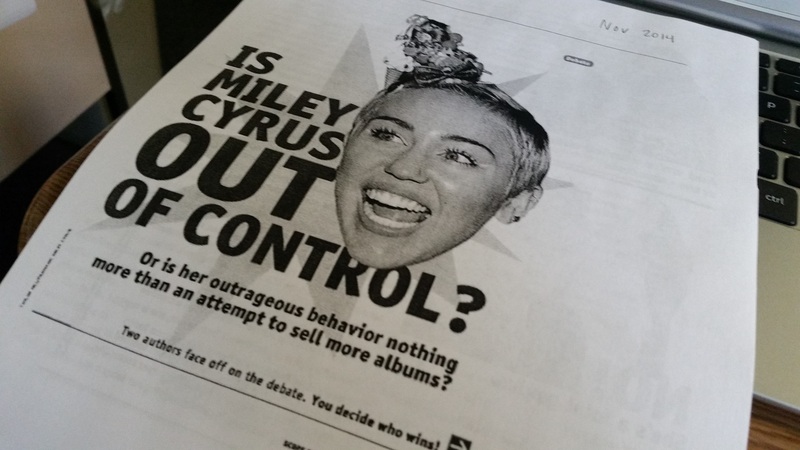 To review this material, students read an article in Achieve3000 that addressed those issues, and then Jerry asked them to make explicit connections between the article’s statements and the textbook’s statements. Students compiled compared evidence on a chart and then discussed the concept’s impact on their personal lives and behavior. Collaborative discussion led to easy review and an effective reflection on the concepts Jerry wanted to teach. Jerry’s students partner to explore the text for supporting evidence. Check out Jerry’s lesson plan and materials here! Jamie Holley’s student practice a partnered reading strategy they often use to support each other in literacy. 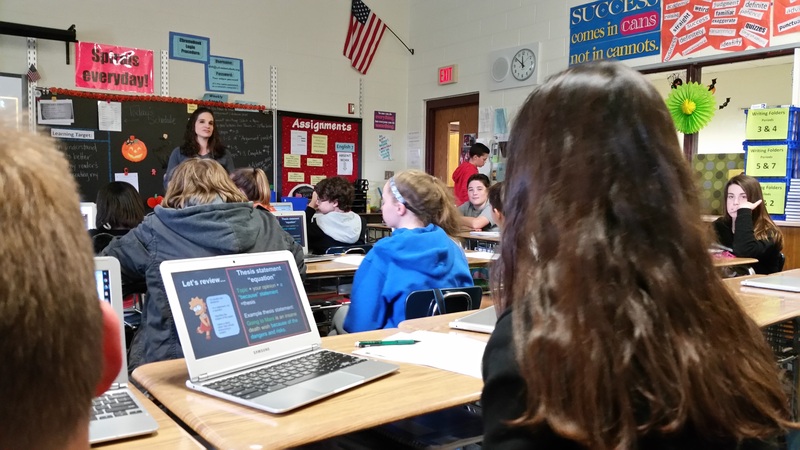 Jamie had noticed that her students were not quite mastering the skills of making inferences or citing evidence, so she designed an Achieve-based lesson to support that skill. Students selected a pair of articles exploring the importance of certain historical figures, such as Mahatma Ghandi. Then, they completed a simple Venn diagram with article evidence. Finally, they made predictions on how these historical figures would address today’s challenges, with the prediction supported by evidence from the article. A student completes a Venn diagram to analyze historical figures in two Achieve articles. Check out Jamie’s lesson plan and materials here! Are you looking for a way to target your students’ strengths and weaknesses? Do you want to make your students more responsible for their learning? If you answered YES to either of those questions then STUDENT DATA SHEETS may be what you are looking for. Learn how to create these DATA SHEETS to regularly enforce the standards, skills, and knowledge you want your students to master. Students will record and track their scores based on the categories you assess. Check out this presentation for rationale, how-to tutorials, and content specific examples. Learn how Achieve3000 becomes a collaborative, authentic learning experience in the hands of Arbor Hills’ Jamie Holley! Someone at a party introduces you to your mother’s only sister’s husband’s sister-in-law. He has no brothers. What do you call this lady? That’s the question that greets Arbor Hills students walking into Jamie Holley’s fourth period Reading 7 class. It’s a bell ringer that gives the students something to focus on and be entertained by as they set up for class, and it works remarkably well. I find myself focused in the time it takes me to work out the problem. Jamie’s students glance at the problem on the SmartBoard as they gather their materials and ready themselves for the lesson. Today, Jamie is moving students from that little bell ringer problem to the exploration of problem/solution as a mode of writing and discussion. Having jumped enthusiastically into Achieve3000 last year during its piloting at Arbor Hills, Jamie is an expert at using its data to understand the needs of her students. In this case, she has seen that they do not perform well when tasked with understanding problem/solution writings. The data has driven her to develop a small project on the thinking mode, relying on material from Achieve to form the basis. That material, however, does not dominate the assignment. Jamie’s expert teaching does. The class starts as many do these days. Students see a Google Slides presentation on the board, and they follow along through simultaneous access on their Chromebooks. Students sit in partnerships as they follow along, and they soon rely on those partners for a warm-up activity. The warm-up requires them to read a short paragraph describing a problem with eel populations. The partners work together to answer some simple problem/solution questions, such as signal words and responsible parties. Student collaboration gets going, and Jamie de-briefs their work after a few minutes. Students collaborate on the warm-up activity exploring a problem with eels. The next stage brings Achieve into the equation, but in a way that truly unlocks the resource’s potential. Partnerships are assigned one of two articles: “No Land? No Problem!” or “No Water? No Problem!” The students read the article to each other aloud, trading off paragraph to paragraph. We all know that these readings are leveled, but Jamie has partnered students according to reading proficiency, ensuring that they are reading identical or nearly-identical articles to each other. As they read, students use the “Setting the Purpose” annotation blanks offered in Achieve (referred to in class as the “circle things”) to note the problem and solution in each article. Finally, they answer the activity questions. This process of partnered reading leads to an environment of high productivity and low stress. Students gain strength from the partnered collaboration, but never draw off task in any significant way. Jamie’s lack of controlling direction throughout the process demonstrates her skill in setting the tone in her classroom. Student partnerships teach each other the content of their assigned articles in Achieve3000. After this engaging and collaborative use of Achieve to explore the text structure, Jamie pushes her seventh graders one step further. She asks them to conduct informal research on problems affecting the Sylvania community for a short report. This work is still partnered as students read about algae blooms or drug abuse. They’re building not simply to a report, but to a problem/solution discussion that will be recorded through MoveNote and shared with fellow students. This opportunity excites students, and on the day of the recording, the time flies as students spend 100% time on task excitedly developing their newscast-style discussion of a community problem and their proposed solution. Jamie provides help throughout the process. Two of Jamie’s students, Lexus and Salma, decided to explore the puppy mill problem affecting the community through the store at the Franklin Park Mall. The girls enjoyed the assignment, stating that they “liked picking the problem.” And, “It was fun. We got to work in partners.” The girls understand the puppy mill problem, and their solution focuses on the buyer. They suggest that if you’re looking for a puppy, “You can adopt from a trusted owner or a shelter that you trust.” When asked why they focused their solution on the buyer, rather than the seller, they respond, ”The articles did not talk much about the stores,” showing how their work has depended on the research they read. It demonstrates the success of the reading instruction. A partnership develops their presentation for the MoveNote recording. Achieve3000 has been established to run automatically. Students could plug into the system and work independently on developing reading skills. Unfortunately, that will not work. Isolating students does not support them in their learning, and using Achieve to push that isolation will not lead to success. Jamie knows that and knows how to avoid the problem. Her project relies on the differentiation power of Achieve, but never once do students find themselves alone in the system. They use it as an organic part of a collaborative, authentic, and engaging exploration of problems and their solutions. These seventh graders will learn and grow through this mode of instruction to become the problem solvers of tomorrow, thanks to Jamie. Read about Lauren Clark’s “Argumentation Writing Guide,” a 21st century approach to Chromebook learning! Lauren’s students are developing argument compositions based on Scholastic Scope material she has collected over years. The source articles present pro and con positions on some interesting topics: Should we live forever? Should we ban competitive eating? Is being bored good for us? Should we deport Justin Bieber? Before today, students chose their topics, read the articles, and began topic development worksheets for the composition. Lauren’s process to this point has demonstrated traditional approaches. Her students read photocopied materials and hand wrote responses to the worksheet. That traditional approach, however, is about to feel a boost that will push it into a perfect blend of traditional and digital. Students follow Lauren’s introduction from their seat. Class begins with a Google Slides presentation that students can watch on the SMARTBoard and access on their Chromebooks simultaneously. The presentation organizes their materials and presents notes on concepts. It even offers an enticing video on the difference between topic sentences and thesis statements, produced by Shmoop. While students handwrite on their development worksheets, they glance at the Chromebook screens. This blending clearly marks ownership. The screen is Lauren; the paper is them. Check out the Google Slides presentation! But, the digital activity of these seventh graders jumps as the class continues. To carry the students through the concepts required to compose an argument, Lauren has designed her own “Argumentation Writing Guide,” where the real transformation of the class is located. The guide is a deceptively simple Google sheet. In reality, though, it is an entire course in itself. On the grid, each row lists a different writing concept connected to writing arguments, everything from argument language and strong evidence to proper MLA citation. On the same row, next to each concept, Lauren has linked Internet resources for independent student learning. So, if a student is struggling with how to write strong topic sentences, she can go to row 13 and click on any of the three supporting resources: two text resources and one interactive resource. If another student was struggling with plagiarism, he could find help in any of four resources, including text, video, and interactive lessons. Lauren’s AWG collects online resources from a variety of sources to appeal to a variety of different learning styles and ability levels. With it, students can customize their learning. Today’s lesson introduces the guide to ground the students in this independent approach to writing. 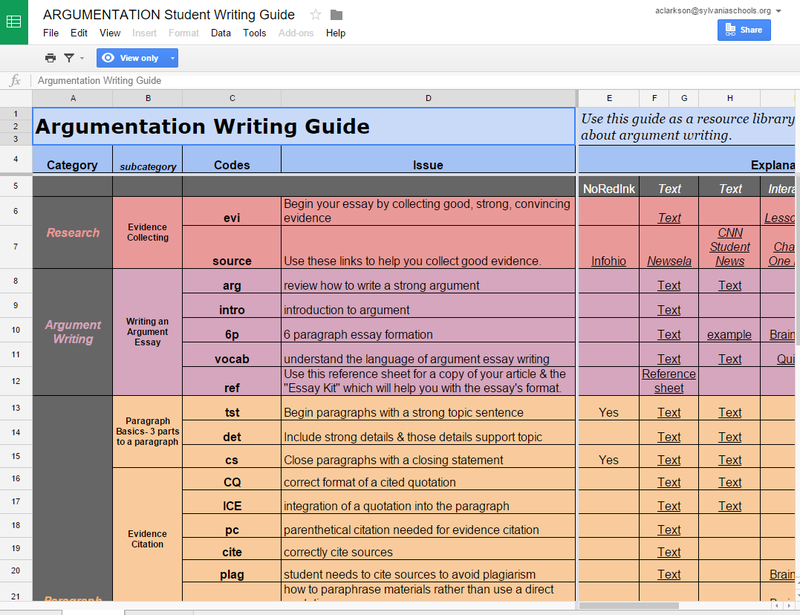 Check out the Argumentation Writing Guide! Traditionally, students learned concepts by listening to teacher lecture or reading a textbook. Application helped reinforce, but the one-dimensional approach of lecture/textbook meant that students would be limited to repeated teaching approaches and a small range of resources. They would also be forced to endure long lectures on concepts that they may grasp quickly, or miss extended discussions on concepts everyone else got when they did not. These are the typical problems with a “One size fits all” approach. Lauren’s AWG offers an opportunity for students to learn and reinforce the concepts they need to study in the format that works for them. Really, it’s an elegant and powerful resource that can transform a limited, teacher-centered environment into a multi-faceted, student-centered one. And even better, any teacher could adapt it to any skills-based or standards-based environment, regardless of content area. Lauren’s class continues as she moves past the introduction of the AWG and into “Hooks,” techniques for generating interest in the opening of an argument. It’s listed on line 24 of the AWG. (When she refers to a hook as a device, one of her seventh grade jokesters complains that “My device has lost power.” He laughs. Lauren stares back with a furrowed brow.) Since the hook is a new concept, Lauren will require all students to learn it, saving differentiated instruction for later. Right now, students watch videos and complete Google Forms-based quizzes to check understanding. The flow of the class begins to shift as students work at their own pace, accessing resources as they wish. While they do so, Lauren never sits still. She floats around the room, answering individual student questions and providing direction as students work. The class time flies. Lauren helps students as they work at their own pace. The success of blended learning here is evident, but that success spreads beyond this one moment. Truly, to grasp the impact of Lauren’s approach one would need to watch the development over time. These seventh graders are moving into a learning environment where they will work at their own pace, reflect on areas of strength and weakness, and collaborate for learning. They will own their work. It’s all because Lauren developed her Argumentation Writing Guide, a foundation of resources and technique that created an environment for independent student learning. Moving from the textbook to the AWG has meant moving from limitations to possibilities.